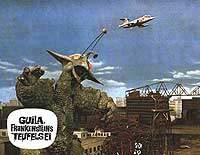 Uchû Daikaijû Girara (1967) - Sci-fi-central.com.  Japan  1967  89m   Directed by: Kazui Nihonmatsu.  Starring: Eiji Okada, Shun'ya Wazaki, Itoko Harada, Peggy Neal, Franz Gruber, Mike Daneen, Shin'ichi Yanagisawa, Keisuke Sonoi, Hiroshi Fujioka, Ryûji Kita, Takanobu Hozumi, Toshiyuki Watanabe, Torahiko Hamada.  Music by: Taku Izumi. 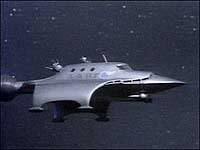 The spaceship AAB-Gamma is dispatched from FAFC headquarters in Japan to make a landing on the planet Mars and investigate reports of UFOs in the area. 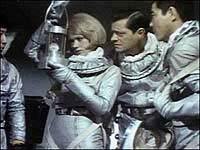 As they near the red planet, they encounter a mysterious UFO that coats the ship's hull with unusual spores. Taking one of the specimens back to earth, it soon develops and grows into a giant chicken-lizard-alien monster that tramples Japan. Needless to say, Godzilla and his pals had something of an impact on the box office. 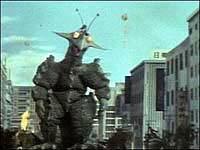 People worldwide were flocking to see Toho studios Kaiju films, which was great for the studio. Not only did they have something that was a smash hit in their home country-it was big worldwide. So of course, others tried to capitalize. In Korea, there was "Yonggary." London gave us "Gorgo." Denmark offered the world "Reptilicus." Even America go into the action with "The Giant Mantis" and "The Giant Claw." I'm sure that Toho was amused and pleased that for a change, a Japanese Studio was giving the rest of world a run for it's money instead of the other way around. Of course, other studios in Japan tried to capitalize on this. 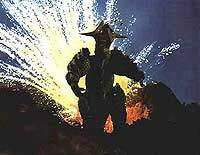 Daei gave the world the "Gamera" and "Daimaijin" films. Toei released "The Magic Serpent." 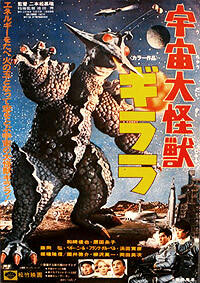 Nikkatsu responded with "Monster From a Prehistoric Planet." 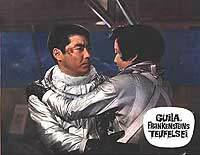 However, the most out there of these movies was "The X From Outer Space", which came from the well respected Shochiku studios (who gave the world films such as "Tokyo Story" and "Night and Fog in Japan"), which also kick started a brief foray into the world of genre films. 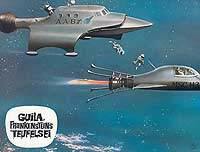 The spaceship AAB Gamma has been sent to Mars so it can investigate reports of UFO's that seem to be surrounding the area. After running into a strange UFO (which, according to one scientist, "Looks like a giant omelet!") that leaves some strange spore-like substance on the ship, the crew decides that would be a nifty idea to bring a sample with them. This of course, turns out to be what Gob from "Arrested Development" would call "A Huge Mistake." 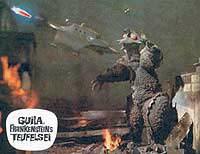 That's because said sample soon turns into a giant monster that begins to run roughshod on Japan because apparently Godzilla or one of Gamera's enemies were on vacation. Also, the monster is named Guilala, and he looks like...well, he looks like a lizardchicken hybrid. 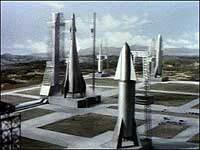 What's interesting about "The X From Outer Space" is that is all starts out a lot like other space themed science fiction movies from the time. There's a bouncy theme song, it's got plenty of cool model and miniature effects, there's plenty of matte paintings, and everyone seems more interested in chilling out and drinking cocktails while bachelor pad music plays than they are solving whatever crisis is at hand. When Guilala does show up, thing takes a turn for the "what the hell" and doesn't look back. There's a sense of fun to most of the proceedings, as if the people who aren't taking all of this too seriously. It's also interesting that even though he craves radiation like a certain mutated dinosaur and it's obvious as all get out that the people behind the movie are doing everything they can to compete with himrip him off (it even breathes fire! ), the whole thing has a lighthearted atmosphere to it. There's little to no attempt at trying to do some sort of social commentary like some of the "Godzilla" movies (or "Mothra" or the genre films Shochiku released afterwards.) This is a to the point monster movie that simply wants to entertain the audience, and damn it, it succeeds. The whole thing is so thoroughly goofy (I dare you not to laugh when an airplane crashes into the monsters head for no reason other than some sort of directorial goof), campy and all around fun that it's impossible not to enjoy what's going on here. Only the most stuffy shirted type could not be charmed at the nuttiness on display. 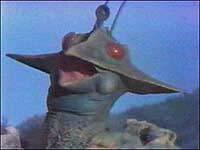 At the end of the day, "The X From Outer Space" is nothing more than a light but charming little Kaiju film. It doesn't have the muscle of the best "Godzilla" movies, but it doesn't need it. It's campy, light entertainment that just happens to be a lot of fun, and that's all I asked for. Review by lovecraft231 from the Internet Movie Database. 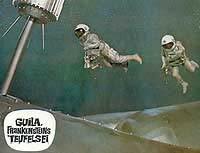 Review - X From Outer Space, The (1967). 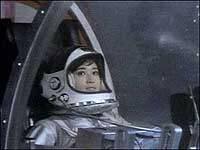 The X from Outer Space (1967). Review: The X From Outer Space. X from Outer Space, The Review (1967).